After taking plagued trips to White Castle and Guantanamo Bay, it just makes sense that everyone's favorite stoners will next have a series of mishaps during the most wonderful time of the year in A Very Harold & Kumar Christmas. In what will hopefully become a holiday favorite film, Harold and Kumar have become estranged from each other with new friends and separate lives. But when a "green" package arrives at Kumar's door, his attempt to direct it to Harold's house results in a prize Christmas tree going up in smoke, thus sending the duo on a journey to replace it. Now we have our first look at the adventure comedy below. Todd Strauss-Schulson makes his feature film directing debut with this holiday comedy written by franchise creators Jon Hurwitz and Hayden Schlossberg and starring Kal Penn and John Cho as our titular stoners. 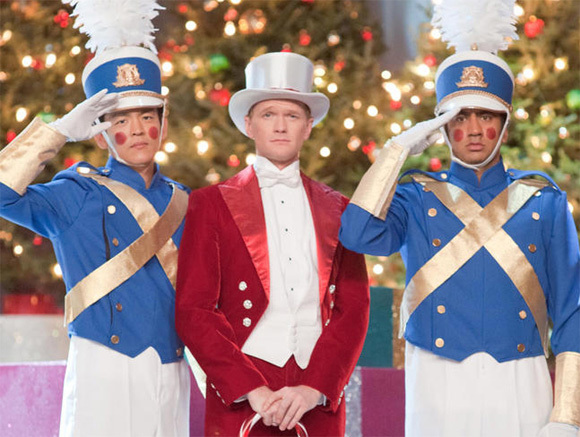 Neil Patrick Harris returns for some of the Christmas craziness that was shot in 3D, complete with some sort of claymation sequence throwing back to classic Christmas specials from decades past. Patton Oswalt, Thomas Lennon, Danny Trejo, Eddie Kaye Thomas, David Krumholtz, Elias Koteas and more also come along for the ride in this holiday comedy which hit theaters on November 4th of this year. Nice! Let's hope this is gonna be better than "Guantanamo Bay"
what? that was funny stuff - how could you not like the parts with NPH? That was actually one of the few parts I liked. There were some good jokes. I'm just saying the first one was miles better. that's fair - i don't like every comedy either. i found these H&K movies to be funny.....but, without NPH - it'd probably be a different story. I hope John Cho gets Kal Penn and Neil Patrick Harris to have cameos in Star Trek 12. So is Kal Penn NOT working for the White House anymore? His position with the Obama presidency was always temporary, so he just took a year or so to walk away from acting and pursue his political aspirations for a bit.